God cares for those who are called to be a part of his plan. 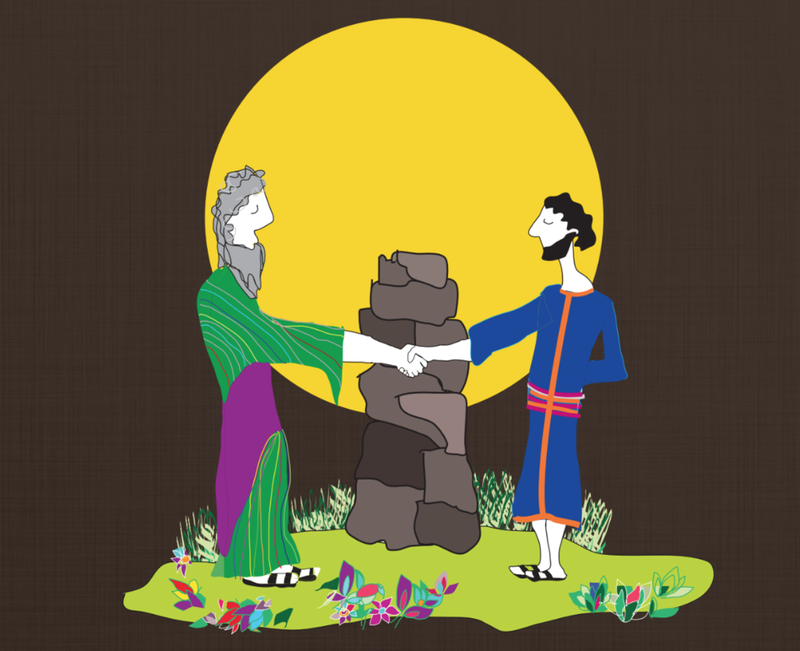 In a dream, God told Jacob to leave Laban so that Jacob could return to the land of promise. Only in this way could the generations promised to Abraham be born. Jesus was protected in a similar way when in a dream God told Joseph to take Jesus away from Herod. Neither Laban's opposition to Jacob nor Herod's opposition to Jesus could stop God's plan. God prospered Jacob, and many years later the Savior was one of Jacob's descendants just as God promised. All of history moves in the direction of fulfilling God's redemptive plan. We are on week 20 in the Long Story Short family devotional (starting on page 131). Read the story yourself (Genesis 30-31) and retell it to your kids. In the devotional I would focus on Day 3 because it connects the story of Jacob and Laban to Jesus. God has gone on record in protecting those whom He has called for a special purpose. What is not in the devotionals this week is the topic of idolatry. Before leaving, Rachel went back to her father's house and grabbed some household gods and hid them from Jacob. Why would she do this? Maybe for good luck or it was revealing her tendency to go back to worthless things for comfort. I had a good discussion with the 3rd-5th graders yesterday about physical idols other religions craft and worship. Yes we talked about how those things are bad but then we turned to Ezekiel 14:1-8 to find that we also have idols in our heart. We have sinful desires to admire things above God to find security, comfort, and peace outside of Him. It would be good to take a night or morning to read with your children Ezekiel 14:1-8 and identify the idols we entertain in our hearts. October's memory verse is Proverbs 3:5-6. Printed bookmarks will continue to be available throughout the month of October at the check in and resource table on Sunday. Also, a digital copy will be sent out each week like the one below. Check out the highlighted portion to know what we'll be quoting on November 5th. We're thrilled to have BOTH camps for kids AND students this year! There will be more information in the days ahead concerning registration and pricing, for now mark these dates on the calendar. Praying for fruitful connection as you disciple your family with devotional and in the moments of life.